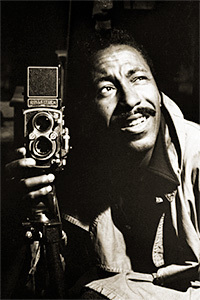 Gordon Parks became the first African American staff photographer and writer for Life Magazine after earning widespread recognition for his 1948 photo essay regarding the life of a gang leader in Harlem. During his career at Life, Parks chronicled subjects pertinent to poverty and racism, along with shooting notable photographs of politicians and celebrities including Malcolm X, Muhammad Ali, and Adam Clayton Powell Jr. In 1969, Parks was also the first African American to write and direct a Hollywood feature film, which was based on his own novel The Leaning Tree (Harper & Row, 1963). He released his second motion picture in 1971, the commercially successful film Shaft. Winner of the National Medal of Arts in 1988, Parks received over fifty honorary doctorates through the course of his career, which lasted until his death in 2006.